London has seen the biggest growth in the private rented sector out of any region in the UK over the last decade. The expansion of rented accommodation as a form of tenure has been driven not only by the dynamics of affordability in the London housing market, but also a preference for more flexible living arrangements. We have drilled down into the results of our country-wide tenant survey, the largest survey of this type ever conducted, to focus on the private rental trends in London, to help inform and shape thinking on how the sector may develop. The first key finding is that Londoners, while just as concerned with the affordability of rental accommodation as those in the rest of Great Britain, place much greater emphasis on proximity to transport links, as shown in figure 1 below. 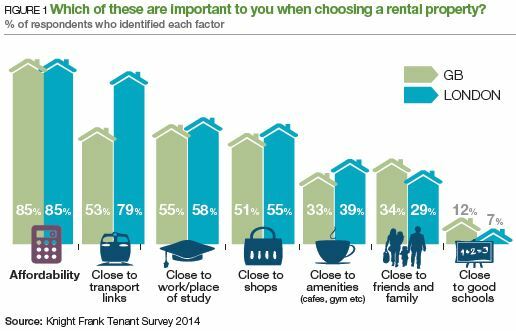 Nearly four-fifths (79%) of respondents based in London said that being close to transport links was important to them when choosing privately rented property. This fits with the increased dependence on public transport in the Capital, and is also supported by the uplift in capital values seen around transport links in the sales market, for example, Crossrail stations. Younger renters are the most likely to factor the distance of a rented property from transport links into their decisions, with 58% of 18-24 year olds across Great Britain saying it was a key factor in choosing a privately rented property. Overall, nearly two-thirds (63%) of London tenants surveyed want to be within a 9-minute walk of a transport link such as the bus stop, tube or train station, compared to 51% of tenants surveyed across Britain. In terms of location vs affordability, a significantly higher proportion of Londoners, especially younger tenants, are prepared to live in smaller types of accommodation to ensure they are in a good location at an affordable price. As shown in figure 2, more than half (54%) of 18 to 24 year olds said they would be happy to live in a studio flat (with communal entertaining space) if doing so made the rent more affordable in a central area. 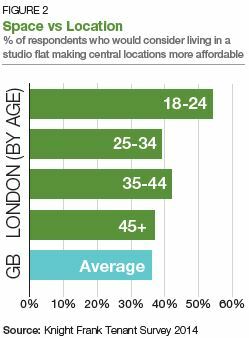 Some 39% of 25-34 year olds and 42% of 35-44 year olds in London would also be prepared to choose a studio in a central location for an affordable rent. When asked if they would live in a “microflat”, a small studio flat around 300 sq ft in size, in a building with communal entertaining space which was in a “perfect” location, 45% of 18-24 year olds in London indicated that they would consider such an option, while 32% of 25-34 year olds and 37% of 35-44 year olds also agreed. This is much higher than the overall GB average of 27%. When it comes to the maximum Londoners are prepared to pay in rent, the figure is slightly higher than the country-wide average. The mean average of our survey responses for those in the Capital shows that the maximum respondents were prepared to pay was 42% of their gross monthly personal income, compared to 40% across Britain. Given that average incomes across London are generally higher than the rest of the country, it could be surmised that Londoners will pay higher rent in absolute terms. Yet the higher cost of housing in the Capital is also reflected, with a higher proportion of Londoners prepared to pay more than 40% of their gross monthly income on rent compared to the average for the whole of Britain (figure 3). 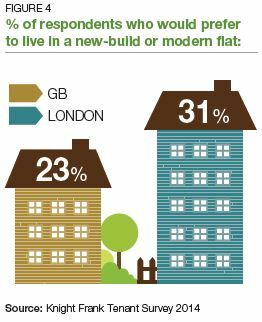 There is also a more significant preference for new-build and modern flats as rental properties among those living in London, as shown in figure 4. While an average of 27% of tenants surveyed across the country said they would pay extra rent for a furnished flat, these proportions rose in London to 37%. Some 54% of 18-24 year olds said they would pay slightly more in rent for a furnished flat, while 44% of 25-34 year olds said the same. It is notable that a higher proportion of Londoners are planning to stay in the private rental sector (PRS) for between one and two years than in the rest of the country. 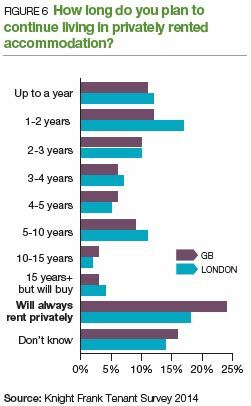 But to assume this shows that the PRS is solely a short-term solution for Londoners is contradicted by the rest of the findings, which show that more than a third of renters surveyed (36%) in London expect to stay in the rented sector for between a further two and 15 years, as shown in figure 6. This is higher than the British average of 33%. However it is also clear that the proportion of tenants who expect to remain in the rented sector on a long-term basis is lower than the national figure, as only 18% of London respondents think they will always privately rent, compared to 24% across the country. The aspiration for homeownership at a later stage is still evident, but as these results show, the idea of the rented sector as just a “short-term” solution is no longer entirely valid. This idea is also underlined by the reasons that people move into private rented accommodation. While 48% of Londoners aged between 45 and 54 say that being in the private rented sector is largely because of difficulty raising a deposit to purchase a home, younger tenants say that the choice of tenure suits their lifestyle, as shown in figure 5. 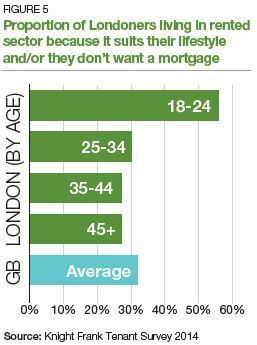 When asked why they are living in the PRS, more than half (56%) of 18-24 year olds surveyed in London say that the rented sector suits their lifestyle, and/or they don’t want a mortgage. Nearly a third (30%) of 25-34 year olds in London feel the same, while 27% of 35-44 year olds give the same reply. 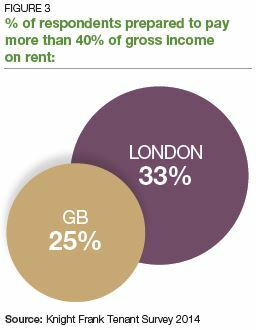 The private rented sector is growing in London and across the UK. While this is undoubtedly linked to trends in house prices, the sector is also expanding amid a demand for a more flexible workforce in key urban areas. As London plays a major role in the UK in terms of job creation, and is likely to continue to do so, the private rented sector looks set to be underpinned by well-designed stock at the right price point in locations close to transport links. All figures, unless otherwise stated, are from YouGov Plc. Total sample size was 3,525 GB adults aged 18+ of which 618 were surveyed in London. Fieldwork was undertaken between 30th July - 11th August 2014. The survey was carried out online. it appears. Knight Frank LLP is a limited liability partnership registered in England with registered number OC305934. Our registered office is 55 Baker Street, London, W1U 8AN, where you may look at a list of members’ names.